FanGraphs has added yet another exciting new feature to its statistical pages. Wins Above Replacement (WAR) Grids developed by Joshua Maciel visually show us the peak years and career trajectories of several players at the same time. Kurt Mensching used it to look at the top 25 Tigers position players of all-time. One thing Kurt noticed about the WAR grid was that it clearly showed how well Lou Whitaker compared to other Tigers greats. That prompted me compare "Sweet Lou" to other top second basemen in the history of the game. First, remember that WAR is an estimate of the number of wins a player contributed to his team's win total above what you would expect from a replacement level player - a player who could be acquired for league minimum salary. An example of a replacement player would be a player in Triple-A, who is good enouigh to get some time in the majors, but is not regarded as a top prospect. WAR takes into consideration everything a player does on the field, including hitting, fielding and base running. Looking at the chart below (click on it to make it bigger), we can see that Whitaker had 74 WAR for his career. This ties him for eighth all-time among MLB second basemen. 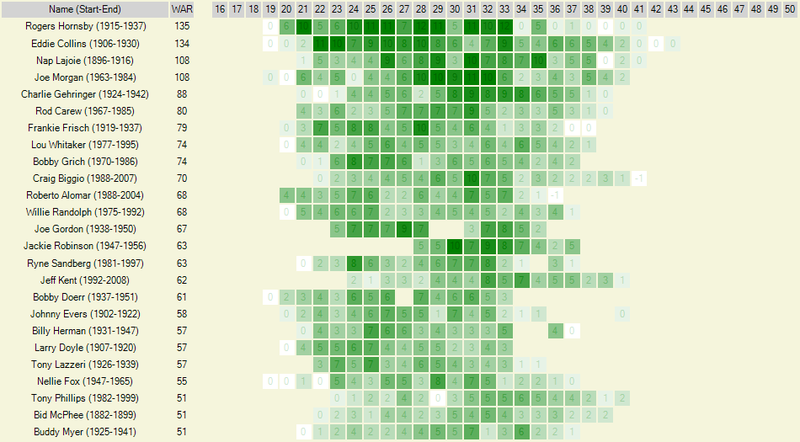 There is one colored block for each year of a player's career. For example, Whitaker had zero WAR at age 20, four WAR at age 21, etc. What is unique about these charts is that the more WAR a player accumulated in a particular year, the darker the color of the block. This allows us to quickly identify the best years of a player's career. Since Whitaker had zero WAR in his first year, his block is white for that year. The most WAR Whitaker had in one season was six. He did that three times - at ages 26, 32 and 34. So, those years have the darkest blocks. The long string of green boxes indicates that Whitaker was good for a long time. Why then was he dismissed by so many writers that he failed to gain the five percent of the vote needed to stay on the ballot in his first year of Hall of Fame eligibility in 2001? One reason might be his lack of a huge impact season which the chart shows clearly. All of the second basemen above him and some below him had dark green boxes indicating seven plus WAR in a season. In other words, Whitaker had great career value, but lagged behind others in peak value. I think the voters remember impact seasons vividly and when a player does not have such a season, he can go unnoticed. An interesting comparison is Whitaker and contemporary Cubs second baseman Ryne Sandberg. We can see that Sandberg does not have as many green boxes as Whitaker, but has more darker green boxes. This says that Whitaker had more good seasons, but Sandberg's best seasons were better than Whitaker's best seasons. Numerically, Sandberg had only 63 WAR for his career which is 11 less than Whitaker. Sandberg had seven years of four WAR or above, while Whitaker had 14. On the other hand, Sandberg had four years of seven WAR or greater and Whitaker never had more than six WAR. Sandberg made the Hall of Fame and Whitaker was left off the ballot by virtually all voters. This might be an indication that the voters favor peak value over career value or it could be that Whitaker's lack of a monster year gave them the impression that he wasn't a great player. Personally, I don't think it's necessarily wrong that Sandberg is in the Hall of Fame and Whitaker isn't. I value longevity and peak equally and can see the arguments on both sides. What bothers me is that Whitaker received no support at all while a comparable player received votes from the vast majority of voters. That is not right for arguably the 8th most valuable second baseman ever. Great analysis, Lee. The idea that people remember peak years instead of steady excellence is obvious when you think about it. But I never thought about it in this context and in relation to a player like Lou Whitaker.